Miso Crafty Knits: Finished: Flat Wristlets Galore! I've been working on this wristlet for a few weeks now. I could've done the simple sew 2 rectangular pieces of fabric together for the exterior and interior then add a zipper and call it a day route, but opted to go fancy instead. This is the result of 2 weeks of hard work. This would've taken much less time if the munchkin had gone to bed when he was suppose to at night, and if the wicked witch neighbour downstairs wasn't banging away on her ceiling to complain about "noise". I have meaner names for her, but I won't subject you to them. My gold leather Coach wristlet that I have had for years. It's not exactly unusable or ready to be chucked, but it's getting dingy and worn out. I had noticed a few weeks back that I'm going to have to eventually replace it and am not sure if I'd be able to go back to Coach in Vancouver to get one. So I figured I would just make it instead. With that said, I still wouldn't turn down anything from Coach if it was offered to me...or if I was passing by a store and saw a wristlet that I liked. My first attempt was the larger version with the green zipper. 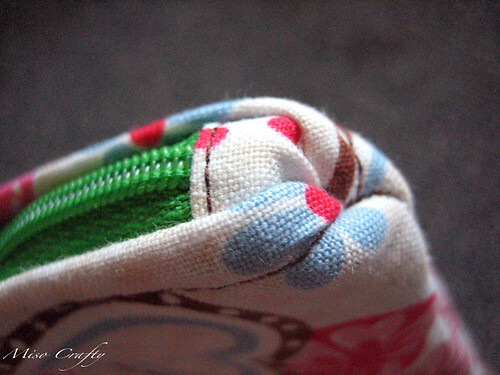 I figured it would be easier to try to work out the zipper details on a larger size than to fight it with a small one. The green zipper was a disaster from day one. 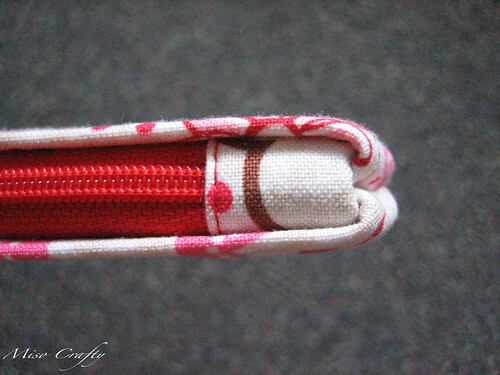 It's an upcycled zipper that I had ripped out from something that I can't remember what, all I know is that I had stuck it in the drawer with the rest of my zippers and didn't think about it 'til this project. I should've noted the zipper "sticking", but really didn't think anything of it. It was slightly warped from being sewn into whatever it was that it was attached too and the sticking was a result of the teeth being made of plastic. I'm assuming someone had ironed over it with a really hot iron and therefore melting the plastic just enough so that when the pull is raked across the teeth, it "sticks". 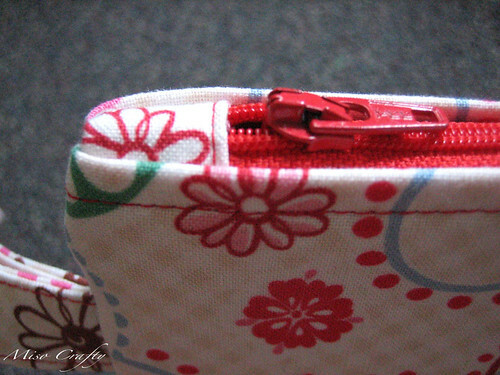 I really liked the zipper end details on my original wristlet and was trying to duplicate it. If I hadn't sewn this one first thing in the morning when I was barely awake, I would've realized that I was sewing too close to the zipper. So one side got botched. 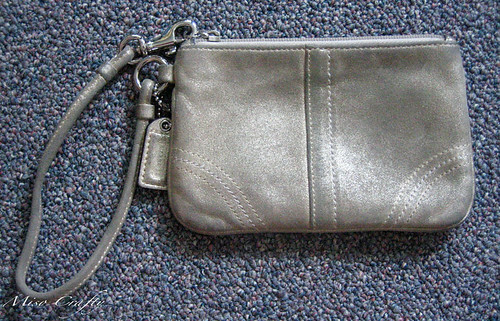 I'm sure no one will notice it, but I see it every time I look at this wristlet. I was also way too tired to change the thread to sew on the pocket, but since the exterior fabric has so many different colors in it, I didn't think it would matter if the thread was a contrast color. At least it matched the outside topstitching thread! 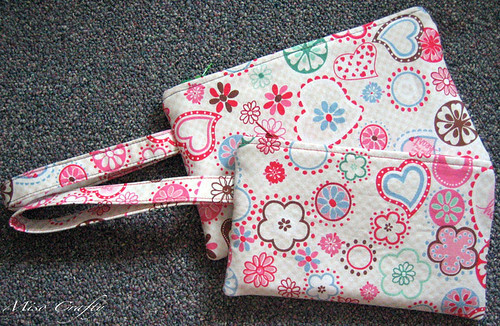 My second attempt was the smaller wristlet that is a bit bigger than my Coach one. I have a thing about always having to carry a pen with me and the Coach wristlet was too small to do that. With my version, it's long enough to stash a pen and a small pad of Post-its (I have a deep, deep love of Post-its). 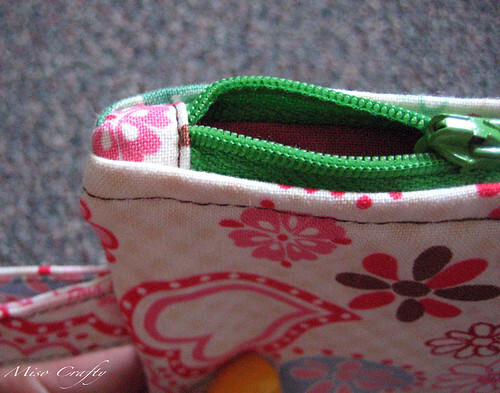 And even though the wristlet is small enough that you can't lose anything in it, I still added a pocket (so you can whip out a Post-it pronto!). This time, the zipper worked out beautifully! It really does help to have a good quality zipper to start out with! I'm so pleased with how it turned out, I gave myself a pat on the back then proceeded to shove the zipper under Brett's nose and gushed about it for 10 minutes. I didn't round the bottom corners like they are on the Coach version. I might in the future, but sometimes you just can't get those corners perfectly rounded and visually symmetrical and being a perfectionist I didn't want to have to deal with that on a sample. I also contemplated adding the hardware to the small version, but nixed it just in case this version didn't work out so well. Instead I just sewed the strap in. The next wristlet I'm definitely adding the hardware! I'm so excited about how these turned out that I've already cut out a bunch! Now if I can only find the time to sew them up... So watch out for them! those are really well made. I quite like the contrasting thread in the first version. Thanks Kat! I really need to walk away and stop nit picking the things I work on. It's one thing to be a perfectionist, but I swear I'm OCD sometimes!! Thanks Steph! 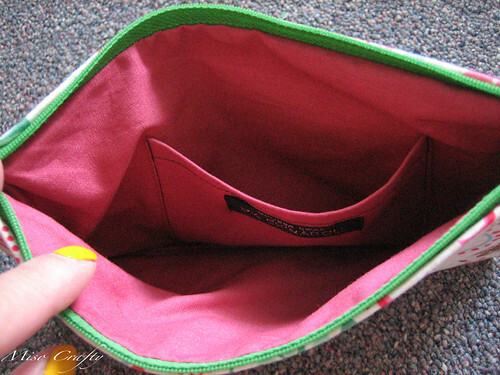 That's my favorite part of the whole wristlet! 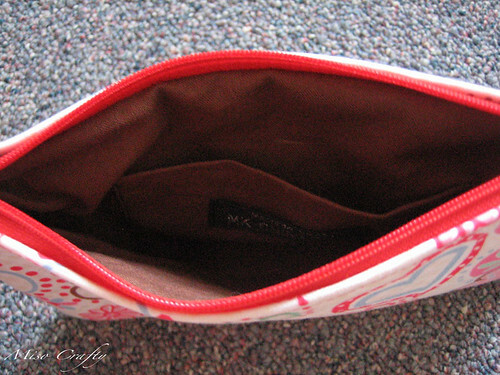 I was googling around for zippered pouches (I sew too) and found your blog. I just wanted to say that your work is wonderful!